- Singing sweetheart of the millenium. The year was 1932; a gramophone record- �Jhulana jhulao� appeared in the music world, sung by a totally unknown singer. It was an instant hit, a class in itself by all parameters and till date the glitter of its glory has not faded. This was the origin of an unknown singer, who was destined to rule the music arena not only for the next fifteen years which he lived, but for many years to come. The singer was �Kundan Lal Saigal� or more popularly, K.L. Saigal. Today, deservedly -the singer of the century. Kundan Lal Saigal was born on 04.04.04 of the twentieth century in the town of Jammu. It is a matter of coincidence that Bade Ghulam Ali Khan, another great in the field of classical music, was born on 02.02.02 and master of the masters amongst the music composers- Anil Biswas was born on 07.07.14. These captivating birth-dates are a matter of fascinating study for numerologists. Kundan�s family belonged to Jullunder (now known as Jallandhar) in Punjab and his father Amar Chand Saigal, was posted as a Tehsildar at Jammu at the time of his birth. There appears nothing exciting about the early life of the singer, except that he was a below average student in his school days. However, he took keen interest in theatre and acting in �Ramlila�, where he played the role of Sita. His mother Kesar Kaur used to sing bhajans and mystic-songs and young Kundan used to accompany her, wherever she used to go for such singing. Once during his early childhood, he lost his voice-quality. His perturbed mother took him to a faqir (saint) called- Salman Yousuf, who blessed the young soul and predicted that one day Kundan will be a world known personality in the field of music. How accurate was the �Divine� prediction! Kundan Lal Saigal, in his early youth worked as a salesman for Remington Rand; subsequently served as a goods clerk with the Railways and later a petty cloth-merchant in Calcutta; before his singing talent was identified by Rai Chand Boral, the music-maestro and composer of �New Theatres� a renowned film producing company of Calcutta. This was the beginning of his acting and singing career and the year was 1932. A line about �New Theatres� of Calcutta. It produced a large number of legendaries in the field of acting, music, photography, direction, and almost in all spheres of film making. The list of such personalities includes- Prithviraj Kapoor, Devaki Bose, Pahari Sanyal, Kidar Sharma, Timir Baran, Rai Chand Boral, Pankaj Mullik, Durga Khote, Kanan Devi, Panna Lal Ghosh, K.C. Dey, Nitin Bose, S. D. Burman, Bimal Roy and others; besides the one and only- Kundan Lal Saigal. 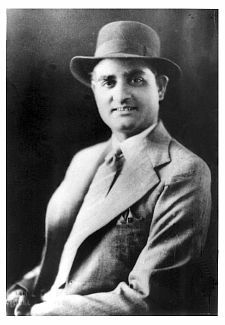 A mere glance at Saigal�s acting and singing career beginning in the year 1932 till 1946, would reveal an amazing contrast. Amongst his earliest films were �Pooran Bhagat� (Music- R.C. Boral) and �Yahudi ki Ladki� (Music-Pankaj Mullick) released in the year-1933. While acting in �Pooran Bhagat�, he sang four bhajans viz �Bhaju mein to bhav se shree girdhari�, �Sumrin kar jiya ram naam�, �Ausar beeto jaat prani tero� and �Radhe rani re de daro naa�. Whereas, in �Yahudi ki Ladki�, he sang four ghazals viz �Nukta cheen hei gamey dil�, �Lag gayee chot karejawa me�, �Laakh sahee hum pee ki batiyan� and �Ye tassaruf allah allah�. Saigal had arrived! A singer who is singing bhajans with such sublime emotional feelings- �Bhaju mein to� and �Radhe rani re�- in particular, is also singing the ghazals of �Ghalib� - �Nukta cheen hei gamein dil� and eight others with a masterly command on Urdu poetry, deep understanding of the thought and above all, keeping the melody in its true eloquence. An exemplary contrast! In a brief span of fifteen years, Saigal sang in Hindi, Urdu, Pashto, Punjabi, Bangla and even in Tamil, in the varied genres of ghazals, bhajans and other modes, many in classical styles. He sang exceptionally well the simplest of the simple songs and with same fervour, he could sing some wonderful classical melodies, including in most difficult �Dhrupad� style. Let me, therefore, evaluate his different forms and styles of singing; beginning with the ghazal. In the recorded history of �ghazal� singing the name of the first and foremost amongst countless singers is and perhaps will remain for a long time of - K.L.Saigal, who needs no introduction to earnest music lovers. The genre was further enriched by another legend- Begum Akhtar. To me, these two legends never sang merely the words, but expressed in their singing, the feelings and thoughts immersed in the lyrics. And, when they sang �ghazals� of Ghalib, the poet appears to have come alive. If you have not yet experienced this soul stirring experience, try it. Saigal was amongst the earliest, who sang and recorded �ghazals� of Ghalib. He sang his nine ghazals, namely - �Aah ko chahiyey�, �Dil se teri nigah�, �Har ek baat pe�, �Ibne mariyam hua karey�, �Mein unhein chherun�, �Nukta cheen hai�, �Wo aakey khwab mein�,�Phir mujhe did-aye-tar yaad ayaa� and �Ishq mujhko nahin�. Is it a coincidence that Begum Akhtar also sang nine compositions of Ghalib- �Ibne mariyam hua karey koyee�, �Aah ko chahiye�, �Dard minnat kashey�, �Taskeen ko hum na royein�, �Zikr us parivash ka�, �Dil hi to hai sangey kisht�, �Phir mujhe did-aye-tar�, �Koyee ummeed bar nahin aatee� and �Dayam paraa hua hoon�. While comparing these eighteen fabulous masterpieces of these two great singers, my pen pauses; it is extremely difficult to comment on their unique voice-quality, citation, soul stirring performance that captivates �nobility� of the accompanying instrument, be it harmonium, tabla and or tanpura. Once while discussing with select scholars of Urdu (one of them being an Associate Professor of Urdu & Persian in the University of Oxford ) about the future of Urdu language, which has certainly enriched our cultural heritage; but with the passage of time, whose learning has been squeezed into a particular class of our society. As a lover of Urdu literature and an ardent listener of music, who can�t even read and write Urdu script (but have read Ghalib and Sahadat Hasan Manto and other legendary Urdu writers and scholars through Devnagari & English) could only add to the discussion that- had these two legends (Saigal & Begum Akhtar) and some other singers were not there, the �diwanns� (compilations of written works) of Ghalib and other outstanding luminaries would have remained buried in the archives (book-shelves) of Colleges, Universities and other research institutions. Doubtlessly, it was Saigal the first and foremost and others to follow his foot-steps, who kept alive (through their singing) � verses of a large number of Urdu poets -known and unknown. Seemab Akbarabadi was a poet of stature. Saigal by singing a few of his ghazals viz �Ab kya bataun�, �Aie bekhabri dil ko deewana banaa dena�, �Duniyan mein hoon duniyan ka�, �Jaag aur dekh jaraa�, �Jalwa gahey dil mein�, �Shukriya hastee ka� etc. he made the poet live for ages to come. At this juncture, it will not be out of place to mention that Saigal by singing the ghazals of Seemab Akbarabadi, made the poet immortal. In the same manner; Habib Tanvir, (the Theatre-maestro) immortalized Nazir Akbarabadi through his all time great play -�Agra Bazaar�. I would like to invite listeners� and readers� attention particularly to the beauty of delivery of words and feelings expressed distinctively in the ghazals of Arzu Lucknavi (popularly & respectfully known as �Arzu Saheb� by music-lovers, singers and the composers). When Saigal sings his verses ��Bahut us galee ke�, �Ghar ye tera sadaa na mera hei�, �Idhar phir bhi aanaa�, �Jeevan asha ye hai�, �Mein sotey bhaag jagaa doonga�,�Matwale paney se jo ghataa jhoom paree hei�, �Preet mein hai jeevan jokhon�, �Sanwariya prem ki bansi bajay�, �Yey kaisa anyay daataa� etc and in particular when the maestro recites- �Chhatee se dhuan uthaa hai jo boond paree hei� lines of the ghazal- �Marwale pane se_�; he makes the listeners enthralled and spell bound. This is just one of such examples of his masterpiece renderings. Let me play for you a ghazal of Ibrahim Zauk, as sung by Saigal. The verses of this ghazal- �Laayee hayat aaye� not only captivates the listener, it deeply provokes his/her thought with the process of message and the immersed mysticism of this immortal piece; especially in the follow up- �Apni khushi naa ayey/ naa apni khushi chaley___�. It compels you to pause and reflect the poet�s creation. Aren�t you transformed and transfixed? The manner in which this ghazal has been recited; without any hesitation, I may add that it is one of the rarest of rare examples of expression of mysticism in the annals of ghazal-singing. These are just a few of such illustrations of Saigal�s capacity of communicating the depth of thoughts and feelings immersed in the lyrics of legends of Urdu poetry and ghazals. Saigal, besides singing ghazals of these three lyricists- Ghalib, Zauk and Seemabh; also sang a number of ghazals of other noted poets of his time. viz Kidar Sharma, Jameel Mazhari, Pt Sudarshan, Safdar Aah, D.N.Madhok, Khumar Barabankvi, Aga Hashr Kashmiri, Ameer Minai, Majrooh Sultanpuri, Bedam Warsi, Swami Ramanand and others. In this context, some of his all time popular ghazals- �Aie dil-e beqarar jhoom� & �Chah barbad karegi� (Khumaar Barabanqvi); �Apni hasti ka agar� (Bedam Warsi); �Deewana hoon�, �Shamma ka jalnaa hai� (Kidar Sharma); �Binaa pankh panchhi hoon mein�, �Us mast nazar per paree jo nazar� (D.N. Madhok); �Kaun veeraney mein dekhega bahaar� (Ameer Minai) etc are a few references, enough to establish the ability of ghazal singing of the maestro. Naushad, the master composer, composed music for the film �Shahjahan�. In this film Saigal acted and sang some popular numbers like �Jab dil hi toot gaya�, �Aie dil-e beqarar jhoom�, �Chah barbaad karegi�. These songs added to the recognition of the music-director. In a tribute to Saigal, Naushad has very appropriately commented-�Naushad mere dil ko yakeen hai yeh mukamal/ Nagmon ki kasam aaj bhi zinda hei woh Saigal�. (Naushad swears by his lyrics that his heart is certain that even today Saigal is alive). If Saigal was a better singer of ghazals or that of bhajans and mystic-songs? This aspect of his music legacy is generally debated amongst his critics and listeners. The era of ghazal-singing in a way commenced with Saigal. Because of its mass appeal, a large number of singers followed; some of them earned fame and handsome money. A few cine-singers also sang ghazals for the films, which further popularized �ghazal� singing. Notable amongst such ghazal-singers were -Begum Akhtar, Mallika Pukhraj, Talat Mehmood, Mohd Rafi, Jagjit Singh, Ghulam Ali, Mehdi Hassan, Abida Parveen, Tahira Syed et al. Yet again, let me introduce you to Saigal�s bhajan and mystic singing aspect. Saigal sang some fascinating bhajans. Amongst, his all time greats include- �Bhaju mein to bhaav se shree girdhari�, �Radhe rani re de daro na�, �Nein heen ko raah dikhaa prabhu�, �Madhukar sham hamare chor�, �Sumiran kar piya ram naam�, �Mein nahin maakhan khayo�, �Suno suno re krishan kala�, �Janam janam ka dukhia prani�, �Jeevan ka such aaj prabhu�, �Hari bin koyee kaam na aayo� etc wherein I found his complete surrender to the �Sublime�, as immense and matchless. Listen to his voice quality, when he sings �Do charnon pe balihari� -in �Bhaju mein to bhaav say shree girdhari�; and �Is bansee mein merey praan basat hein� in �Radhe rani re�; � Chahun or merey ghor andhera� in �Nein heen ko raah dikha prabhu�; here he makes the listener visualize, what blindness is. After listening to these renderings, I have no hesitation to admit that Saigal makes me cry time and again, whenever I listen to these heavenly gifts to mankind through Saigal. Such illustrations of communicating the feelings expressed in the bhajans, which Saigal sang are endless. Though, it is the listener�s understanding and intake, as to how he/she enjoys the allure of the singer�s renderings. The fact remains that music cannot be understood with the laws of physics or mere theoretical knowledge. The saying goes true with the music of Saigal, as well. If someone wants to enjoy the music and more particularly the melodies of Saigal, one must listen to them with heart and not merely with head. A unique feature of Saigal�s singing was that he always sang totally at ease, in a totally relaxed manner, without any particular kind of physical-gesture, which is not usually noticed in the music concerts. Once, while discussing Saigal and his music with Raghva R. Menon (the biographer of Saigal) I was given to understand that he himself was fortunate enough to have listened to Saigal in person, four times during the maestro�s life time. He recalled that when Saigal used to sing, there was never any kind of expression on his face nor any kind of hand movements. It almost appeared that sound was coming out of a statue or a robot. This was, thus, a unique characteristic of the maestro�s personality. In addition to ghazals and bhajans, Saigal sang a large number of songs -classical and or otherwise- which will continue to haunt the listeners till there is music in the atmosphere and there are listeners, who value the meaning of love, affections, virtue, endearment and pleasure of solitude. In the present day set-up of mad rush for amassing wealth and other material possessions, by means fair and foul, and consequent distress of head and heart; one should try to understand the meaning of contentment and solitude through such divine and heavenly music. Saigal�s contribution in this respect will be adjudged as �everlasting� ! A totally un-known poet wrote one of the easiest looking lyrics for Saigal viz �Ausar beeto jaat pranee tero ausar beeto jaat/ is kaal ki hera pheree mein tero ausar beeto jaat/ saath mint (minute) gujrey gaya ghanta, chaubis mein din-raat (day & night)/ pal pal kar key ksheen hot hein_____�. The impact of this mystic song, as Saigal sings is simply matchless. I am very much confident that lyricist could never have imagined that he wrote such fascinating lines. Likewise, listen to �Preet mein hei jeevan jokhon/ jaise kohloo mein sarson�; what a wonderful expression of pain of love! The lines were written by Arzu Lucknavi and composed by Pankaj Mallick in film �Dushman� in the year 1939. The delivery of words, once again and quality of music rendered is a class in itself and words will be inadequate to express my feelings on this immortal rendering. To my mind, �Babul Mora� has proved to be the most popular and rarest of the rare high quality film or non-film song of the century. Prior to Saigal, �Babul Mora� was also sung by Ustad Faiyyaz Khan in the year 1932. In view of the fame and applause of the listeners for Saigal�s �Babul Mora�, a galaxy of singers singing �Babul Mora� followed. The list of such luminaries includes: Kanan Devi, Pt Bhim Sen Joshi, Kesarbai Kerkar, Mushtaq Hussain Khan, Siddheshwari Devi, Rasoolan Bai, Begum Akhtar, Girija Devi, Kishori Amonkar, Jagmohan, Mahender Chopra (Saigal�s son-in-law), Khadim Hussain Khan, Shanti Sharma and Padma Talwalkar. Did any of them outstand Saigal? In the present time, well-known ghazal-singer Jagjit Singh, came to limelight by his �Babul Mora� which he sang along with Chitra Singh in early seventies. He sang and recorded yet another time �Babul Mora�, which is his solo version. A collection of all these recordings of �Babul Mora� sung by these luminaries; is certainly a �Collectors� Treasure� and can be made available to the music-lovers. Once while discussing music of thirties & forties with the master-composer- Anil Biswas, (who brought Mukesh and Talat Mehmood initially to limelight) about Saigal�s �Babul Mora�. His remarks to this were simply fabulous- �Betey, Saigal ke alawa kisi ka babul nahin chhoota�. Anilda (Anil Biswas) is no more; but in the casual manner, what he said, I have nothing to say on his comments. As I became speechless. But, the fact remains that �Babul Mora� sung by Saigal will be listened by upright music-lovers time and again for the ages to come. About others, no one can predict. Rest, I leave it the listeners. Let them evaluate. Pankaj Mullick recorded his three songs viz �Aie qatib-e-taqdeer, Do naina matware and Chhupo naa chhupo naa�. Saigal, as well sang these three songs in film �My Sister� in the year-1944. The music was composed by Pankaj Mullick. Both the singers were and are considered to be �Masters� and any comparison is certainly meaningless. But, the fact remains that what Saigal sang, it will be remembered till time stops. The film �Devdas� released in the year 1935, is a milestone in the history of Indian cinema, primarily because in this film, Saigal acted and sang his all time favorites- �Balam aye baso merey man mein�, �Dukh ke din ab beetat naahin and just two lines of a classic �thumri�- �Piyaa bin naahin aawat chein� (earlier sung by Ustad Abdul Karim Khan). The music of this film was composed by Timir Baran, who played �Sarod� for the first time in the history of film-music, while composing �Balam aye baso morey man mein�. When Khan Saheb came to know about his singing, he called on at Saigal�s residence and asked him to sing for him once again in his presence. After listening to Saigal, he was spellbound over Saigal�s mastery of expression and his ease of singing. He enquired as to who is his Ustad (teacher), who has taught him singing. To this, Saigal replied that he has not learnt from any �Ustad� and it is only �Ooparwala� (�Almighty�), who has taught him singing. Khan Saheb blessed the maestro and gave him a hundred rupee note, which Saigal kept with him till his death, as a token of his respect to Ustad Abdul Karim Khan. During the course of shooting of the film ��Devdas�, Sarat Chandra Chatterjee, the celebrated author visited the sets. He was deeply impressed with the acting of Saigal; though, he was surprised as to how a non-Bangali (Punjabi) could understand so intelligently the character, he created in his novel. The other notable features of this film were that it was produced and directed by P.C. Barua (who himself earlier acted in its Bangla version) and its photographer was Bimal Roy, who later on produced and directed another version of �Devdas� with Dilip Kumar as its hero. It is needless to add that as a mark of respect; Bimal Roy dedicated his film �Devdas� to the memory of K.L.Saigal and P.C.Barua. While waiting for a train at a railway platform, he wrote a fascinating poem on the back of the railway receipts. In this poem, he has expressed his attachment to the city of Calcutta, which shaped his destny and initial personality. From Calcutta Saigal later-on moved to Bombay. I have a copy of the manuscript of this verse entitled -�O des se aaney waley bataa�. The pain of parting expressed in this poem is somewhat unique and thereby is a matter of deep study of poet�s head and heart. Saigal sang two Punjabi numbers -�O soney sakia meri galee wee� & �Mahee naal jey akh lardee kadee na�. Both these songs bear the fragrance of soil and soul of Punjab. Though, he himself was a Punjabi, a question is generally asked: why did Saigal sing only two songs in Punjabi; as against 28 songs he sang in Bangla. On this question, I once spoke to one of Saigal�s close relatives, who narrated that during one of his visits to his home town Jallandhar, a Punjabi singer from a nearby place named �Sham Chaurasi� came to meet Saigal and told him in Punjabi- � Hunn tussee Punjabi wich wee ganaa shuroo kar ditta hei; assee tan phukhey mar jawaan gey� (Now that you have started singing in Punjabi as well, we will be starved to death). At this Saigal assured him that he will no longer sing in Punjabi. And he did keep his promise. Dilip Sarkar son of B.N. Sarkar, the owner of �New Theatres� while speaking at a public gathering narrated that once Saigal accompanied Pankaj Mullick to Santiniketan, where he introduced Saigal to Tagore. Gurudev asked Saigal to sing. After listening to Saigal, the poet blessed him and appreciated his performance. Saigal sang 28 Bangla songs. The beauty of his Robindra Sangeet and Bangla singing lies in its totality. At times, the candid listener, even without understanding a single word of language (Bangla) of the respective verse of the song, is spellbound by his loveable and divine voice quality. Likewise, it must be recorded that Saigal also sang two Tamil songs in Tamil version of film �Devdas�. * �Shubh din aayo� & �Prem jogan bun gayee�- both sung by Ustad Bade Ghulam Ali Khan in film �Mugal-e- Azam�, music-Naushad. * �Jhanak jhanak paayal baaje�- sung by Ustad Amir Khan in film �Jhanak Jhanak Paayal Baaje�, music- Vasant Desai. * �Aaj gavat man mero jhoom key�- sung by Pt D.V. Paluskar & Ustad Amir Khan in film �Baiju Bawra�, music � Naushad. * �Ketaki gulab juhi�- sung by Pt Bhim Sen Joshi & Manna Dey in film �Basant Bahaar�, music - Shanker Jaikishan. * �Ritu aye ritu jaye�- sung by Manna Dey & Lata Mangeshkar in film �Humdard�, music - Anil Biswas. * �Garjat barsat saawan aayo rey�- sung by Lata Mangeshkar in film �Malhaar�, music � Roshan. * �Garjat barsat saawan aayo re�- sung by Kamal Barot in film �Barsaat Ki Raat�, music � Roshan. * �Boley re papiharaa�- sung by Vani Jairam in film �Guddi�, music - Vasant Desai. * �Man ki been matwari baaje�- sung by Rafi & Lata in film �Shabaab�, music � Naushad. * �Laga chunri mein daag�- sung by Manna Dey in film �Dil Hi To Hai�, music � Roshan. * �Tarana�- sung by Jagjit Singh in film �Kalka� in his own music. In the bouquet of all these classical melodies, when Saigal�s evergreen �Sapt suran teen gram� sung in classical (Dhrupad) form and �Diya Jalao� from the film �Tansen� (music- Khemchand Prakash) are included- the beauty of the collection emerges multifold. �Saigal was like a soft grass sprouting out of the holes of a solid cement wall, always bubbling with life, full of enthusiasm, an epitome of gentleness, as it were. It is a rare experience to come across such loving person�- perceived Kanan Devi. Saadat Hasan Manto, the legendary Urdu writer, while writing a sketch of actress and singer �Noorjehan� wrote- �Saigal key baad mein Noorjehan ke galey se muttassir hua__. Jab tak rekaard jinda hai, Saigal mahroom ki awaaz kabhee nahin mar saktee.� (After Saigal, I am impressed with the voice quality of Noorjehaan___. As long as Record (Gramophone-Record) is alive, Saigal�s voice will never die). The candid truth immersed in these lines came from the soul and not merely from the heart. Apart from being an actor and a singer �par-excellence�, Saigal was a wonderful human-being. There are a large number of incidences to establish his kind-heartedness towards whosoever came in his contact for help. His driver, Yousuf once narrated with tears in his eyes an incidence of the life of his master. Yousuf told a columnist that once, when he fell ill, Saigal came to his house with lot of fruits and medicines. After enquiring about his health, Saigal started rubbing and pressing his legs. �Sahib, wo to ek farishta the� (Sir, he was an angel.) -said Yousuf, in a voice choked with emotions. Kidar Sharma, the famous producer-director became very close to Saigal; as it was Saigal who introduced Kidar Sharma to Devaki Bose to initially work for �New Theatres�. Subsequently, it was Kidar Sharma who wrote some memorable songs for Saigal such as �So ja rajkumari�, �Balam aye baso mere man mein�, �Dukh ke din ab beetat naahin�, �Mein kya jaanu kya jadoo hai� �Kya humne bigara hai� etc etc. In his several interviews he (Kidar Sharma) admitted that had Saigal not been there, his fate would have been different. As the fate would have been, later on, it was Kidar Sharma, who was instrumental in launching Raj Kapoor, Madhubala and Geeta Bali in his films. By the year-end of 1946, it appears that Saigal had the intuition that he was not going to live long more. He was a patient of diabetes and had other problems. He left Bombay, where K.N. Singh, one of his closest friends besides others came to see him off at Bombay Central (railway-station). Saigal reached Jullunder on 26 December, 1946 by Frontier Mail (which proved to be his last journey) at about 4.00 a.m. when it was extremely cold. He was wearing a brand new woolen suit. At the railway platform, he saw a beggar shivering with cold. Saigal, who was a little ahead of his family took out his coat and gave it to the beggar and also about 1800 rupees from his purse. This particular incident was narrated to me by two of his relatives separately, one being Smt Durgesh Mehta, niece of Saigal (daughter of Saigal�s elder brother -Hazari Lal Saigal), who was brought-up by Saigal as his daughter; and also by Roshan Lal Saigal, a nephew of Saigal, who met me at Dehradun in October, 1994. Saigal on reaching his home town Jallandhar, in view of his poor health and the intuition that his doom�s day was fast approaching, got his head shaved. As he was too weak, he had to call his religious mentor �guru� from nearby village- �Noormahal� for paying his last respects. Since he was very fond of �sarson ka saag�, a mound (37 kg) saag was got prepared and distributed to all and sundries in fulfillment of his last wish. The inevitable came on the wee hours of 18 January, 1947 when the whole of Punjab (of un-divided India) was in-flames on account of partition riots. Smt Durgesh Mehta (who was at his death-bed) narrates that about 30-40 close relatives thought that it will be most appropriate to have the last rites performed as early as possible. With all the heavenly melodies of Saigal alive in the hearts of millions of music lovers; who says Kundan Lal Saigal is dead?